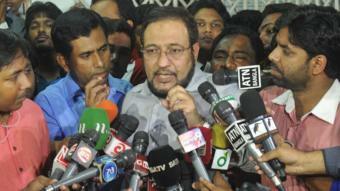 It was early evening on Monday 22 August when the men came for former Brig Gen Abdulahail Amaan Azmi. There were about 30 of them, according to the caretaker in the apartment block where he lived. Abul Kalam Azad says they were in plain clothes but had an air of confident authority. Some carried pistols. Gen Azmi hid in an empty flat on the fifth floor. 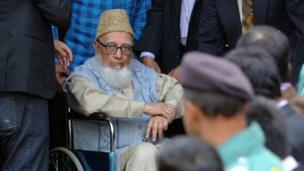 He is the son of Ghulam Azam, a former leader of one of Bangladesh's main opposition parties, Jamaat-e-Islami, and would have known that the sons of two other senior Bangladeshi politicians had been kidnapped earlier in the month. The United Nations and human rights groups including Human Rights Watchand Amnesty International have been warning for years that forced disappearances and extra-judicial killings are common in Bangladesh. But this year, there has been an alarming rise in the number of cases. The men who came for Gen Azmi did not produce any identification documents. They demanded to know where the control room for the CCTV cameras was, and took the discs from the system. When Mr Azad, the caretaker, told them he did not know where the former brigadier general was, they dragged him into a side room off the garage and beat him. He kept silent, so they began searching flat by flat, working their way slowly up through the building. The Bangladeshi human rights organisations Odhikar and Ain-o-Salish Kendra keep a running tally of the number of people who have been taken. They believe some 60 people have gone missing in similar circumstances this year alone, and about 300 over the seven years since the government has been in power. Bangladesh-based journalist David Bergman has been tracking what happens to the disappeared. According to his figures, about half of those taken this year eventually reappeared. The lucky ones - a small minority - were simply released, with threats of dire consequences if they ever talked about what had happened to them. Another 30 or so turned up in police custody or in court charged with some offence. This is what happened to two men who were at a Dhaka cafe when it was attacked by Islamist militants on 1 July. They went missing after the commando raid that ended the siege, only to be formally arrested a month later. The fate of the other secret detainees is even more sinister. Fifteen are dead, most killed in alleged shootouts with law enforcement agencies. Nineteen people remain missing. 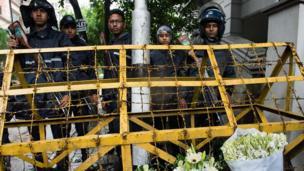 The human rights groups allege the Bangladeshi government is using the security forces to target rival politicians and activists, a claim it denies. "We can safely say there haven't been incidents of disappearances or kidnap with law enforcement agencies in the last two or three years," Bangladesh's Law Minister Anisul Huq tells me. "Whenever there is even one complaint that is found to be true, then we investigate." 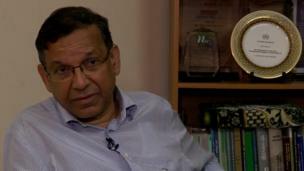 Mr Huq says the disappearance claims are part of a plot by opposition parties to discredit the government. "There are many frivolous complaints, and they are trying to get mileage from that by complaining to the human rights activists or to journalists so that it can be fanned up," he says. "If they have a list I would like to look into it, and I am saying I will look into it." But the UN Working Group on Enforced Disappearances says it has repeatedly asked Bangladesh to investigate the role of law enforcement agencies in disappearances and killings over the past five years. And, like Human Rights Watch and Amnesty International, it says it has requested information on named individuals. Yet despite reminders, the UN says, it has received no response from the government. The men did eventually find Gen Azmi. They smashed down the door of the flat in which he was hiding and dragged him out into the hallway. Mr Azad saw what happened next. "They tied a blindfold around his eyes," he says, "and took him downstairs and pushed him into a mini-van. "We haven't heard anything since," the former brigadier general's 83-year-old mother, Syeda Afifa Azam, tells me. "We don't who took him or what has happened to him," she says, breaking down in tears. Meenakshi Ganguly, of Human Rights Watch, says the impact of forced disappearances on families is terrible. "In all the human rights work I do, this is the worst abuse because people just never know what has happened, they just keep waiting for people to come back home," he says. "At least with extra-judicial killings, there is some sort of closure. "With disappearances, families just keep waiting." Gen Azmi's family say they asked the police to investigate, but the police told the BBC they had no knowledge of the case. "How can a mother suffer this?" asks Mrs Azam.